I have read your informative and very interesting report from August 2004. Congratulations on a fine achievement and in particular on having the confidence to proceed beyond the ice cave area to the Dilisang Pass, when you remained uncertain exactly where it was. Your website is great - you have led amazing lives! I visited your website, which is very useful for tourists in general and the Wakhis in particular. The Wakhi educated younger generation is appreciative and indebted for your intellectual contributions to pay attention to this race and their culture. I visited your web site and I found it very interesting, my best compliments for your trips and for the pictures. Reading your report about the traverse from Wakhan to [Pakistan] made me want to visit Wakhan and cross Irshad Uween. Help support John and Kimberley's exploration and publication activities. Read the expedition report, or read it on W.L. Gore's / WINDSTOPPER ® Adventure Diaries. Roadtrip America's book review says it's "the best guide we have ever seen about the Grand Canyon." 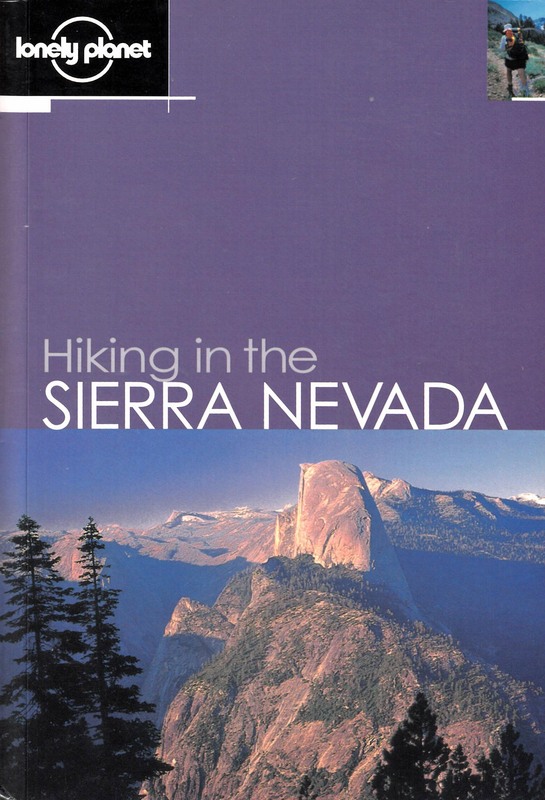 " Hiking in the Sierra Nevada is a user friendly, rock-solid guidebook with clear writing, useful topographic maps, inviting photos and it's conveniently sized to fit in the side pocket of your pack." John Mock awarded grant to document traditions in Afghanistan (2007-2010). John Mock elected to Executive Council of the Association for Nepal and Himalayan Studies (2007-2011). John Mock elected to Board of Trustees of the American Institute of Afghanistan Studies (2007-2010). "Inside Pakistan" presented at a symposium titled "The Current Crisis: Focus on South Asia," sponsored by the South Asian Studies Initiative, the Center for Global International & Regional Studies, and the Office of the Chancellor, University of California at Santa Cruz, November 8, 2001. "The Wildlife Conservation Society applauds the Afghanistan Government's recent declaration establishing the entire Wakhan District, one of the most remote areas of Afghanistan, as the nation's second national park. The Wakhan National Park, with its beautiful alpine grasslands and craggy mountains, will provide protection for Afghanistan's rare and vulnerable wildlife such as the snow leopard, Marco Polo sheep, lynx, Himalayan ibex and urial. This new protected area will be co-managed by the Afghanistan Government and local communities, providing livelihoods related to the park and improved services to one of the poorest and most isolated regions on earth. The new park, just over 1 million hectares or 4,200 square miles, is in Afghanistan's far northeast, and borders Tajikistan, Pakistan and China; its narrow valley landscape is sandwiched between the Pamir and Hindu Kush Mountains. This huge new protected area is about 25 percent bigger than Yellowstone National Park. Network members John Mock and Kim O'Neil, and George Schaller have been working toward this end. This is indeed good news!" 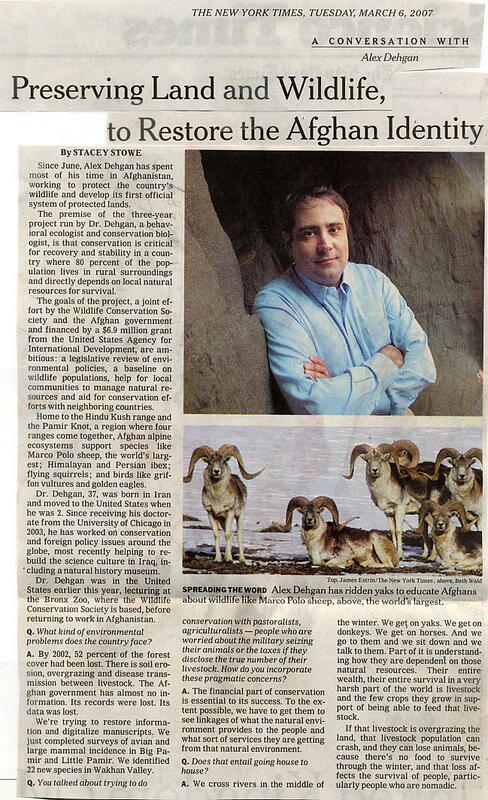 Read (page 1 of 2, and page 2 of 2) the March 6, 2007 New York Times article "Preserving land and Wildlife, to Restore the Afghan Identity" about the Wildlife Conservation Society's Afghanistan Biodiversity Project whose Community Conservation component in Wakhan is managed by John Mock.